For what is surely to be Daughter's last year of Girl Scouts, I volunteered to handle the Girl Scout cookie booth sales. 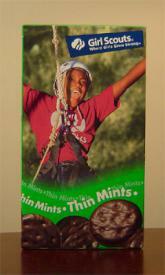 [You're now thinking about Thin Mints, aren't you? Yummmmmmmm.] On the upside, the troop leader's father -- or "Cookie Grandpa" as he is known -- is taking care of stocking up on the cookies, distributing for individual sales, and delivering and picking up everything needed for the booth sales each shift. In short, the only task I have is getting the girls' parents to sign them up for a shift. You would think I was asking them to take on a task of Herculean proportions rather than stake a claim for one of 12 1.5-hour shifts. It has been amazingly difficult. Three of the nine other mothers and the girls took repeated attempts to wrangle a commitment out of. Three others never responded to repeated email requests and in-person requests and had no contact with me until yesterday, the day before the first booth sales. One finally called me after getting the WTF email direct from the troop leader. "I never got your emails," she said. What she meant to say -- and what she eventually admitted to -- was that she never looked in her "spam" folder despite the fact that every new person who sends her an email first goes to a spam folder. If that were the case with my email provider, first, I'd get a new email provider. But if I couldn't do that, I'd at least look in the damn spam folder once a day or every other day or at least once a month. The third one? Sorry, her daughter isn't available. Why don't I sign up for another set of booth shifts and she can try to make it then? Hahahaha. Ha. Ha. So Daughter is scheduled for one shift with another girl today. And then she and I are going to cover a three-hour shift by ourselves tomorrow, which is apparently not the Girl Scout way of handling it as there are supposed to be two Girl Scouts in attendance. Perhaps I can wear Daughter's old sash. It sounds like the girls may be "over" Girl Scouts. I am sure they hear from someone that shifts are needed so the girls themselves should know about how they are needed to sell cookies. I snorted coffee practically over you being in a Girl Scout sash! The scary thing is my mom would have done that. You are totally correct. In fact, I should lay blame at the feet of those 12-year-old daughters. Excellent point. P.S. I'll try to get a photo of me in the sash. Too bad you can't offer some sort of reward for the scouts based on how many hours they help at sales booth. I was a troop leader and cookie mom for years. I feel your pain.